What dye can I use for airbrushing handmade wool teddy bears? The Marvy Fabric Marker is a giant size marker (5″ long) with bullet-shaped tip that can mark, draw and write on any fabric. 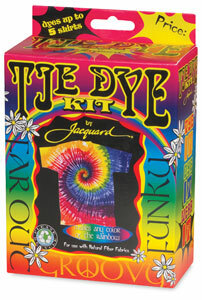 This non-toxic, permanent color dries instantly – no steaming or ironing is needed. 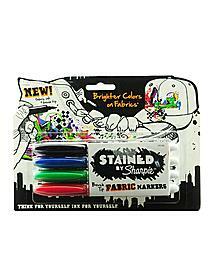 Sharpie brush-tipped fabric markers were developed for optimal performance on most fabric surfaces. Features bright, bold colors—perfect for staining your stuff. Ink resists fading on most fabrics so that you can wash without worries. What you want is not, in fact, a dye, but instead a very thin fabric paint. These can be used without simmering in water, which seems important for your method. Remazol dyes, which are available in South Africa from Melanie Brummer, work well on wool, but the process of setting hand-painted dyes on wool is more complex, as it requires moist heat. Fabric paints will be permanent if you follow the manufacturers’ instructions. You can thin the fabric paint with water, but dilute it no more than the manufacturer says to; for even more thinner colors, you can dilute a fabric paint with a transparent medium sold in the same line of fabric paints. Some fabric paints need to be set with dry heat, using an iron or a heat gun (which is like a hair dryer without the fan), or a commercial clothes dryer, while others are permanent without heat-setting; again, check the manufacturer’s instructions. For example, Jacquard Dye-Na-Flow fabric paint, which has been created to be thin enough to simulate the effect of dye, can be used for air-brushing fabric. Add up to 25% the volume of water to thin it; for thinner colors that still have enough binder to be permanent, dilute with any quantity of Jacquard Colorless Extender. To avoid the heat-setting step that this paint otherwise requires, buy Jacquard Airfix, which contains an acrylic catalyst that can be mixed into fabric paints before use so that they do not need to be heat-fixed. There are many brands of airbrush inks that will work on fabric. Jacquard Airbrush Paints are made by the same manufacturer as the Dye-Na-Flow paints I described above. Again, they either require Air Fix to be mixed in before use, or a heat gun to set the paint. Dr. Ph. Martin’s Spectralite is used with a catalyst similar in function to Jacquard Airfix, called Dr. Ph. Martin’s Spectralite Catalyst; it can also be used with a Heat Set additive, but if used without either additive will not be permanent on fabric that is washed. If you cannot find any of these paints locally, they can be ordered online from Dharma Trading Company in the US. 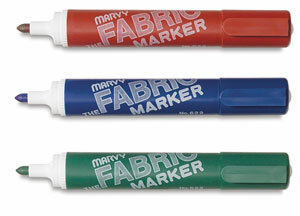 Fabric markers will work well for your purposes, and many of them require no heat-setting at all. Like airbrush inks and other thin fabric paints, they contain pigments, rather than dyes, mixed with a binder to hold the pigment to the fabric. They are usually thin enough to leave very little feel on the fabric. Practice on scrap material first to get a feeling for blending colors. Some brands are easier to blend than others. Be careful about buying a permanent marking pen which is marketed for use on materials other than fabric. For example, ordinary Sharpie permanent markers can be used to color fabric, but, whether they are heat-set or not, they tend to wash out of the fabric after only a few washings. For an item that will not be washed, they are adequately permanent. They do not run when fabric colored with them is dampened with water; the only problem is that they tend to gradually disappear when laundered repeatedly. There are many brands of fabric markers which are very permanent on fabric, including a relatively new line of Sharpie brand fabric markers which I have not tried yet. Just make sure that the label of whatever marker you buy specifically says “permanent on fabric”. If your brand has “fabric” in the name, it should be fine. My favorite markers are the fat Marvy broad point fabric markers, because they produce bright long-lasting colors, and they do not tend to dry up in the drawer. They do not require heat setting. Many other brands of markers tend to dry out by the next year, no matter how tightly they have been capped. Even though you will be probably buying your fabric markers locally, you might want to take a look at Dharma Trading Company’s page of Fabric Markers, just to get a look at a number of different brands and their whether they have any heat-setting requirements. This entry was posted in dyeing wool, fabric paints and pigments on September 8, 2014 by pburch.